GREAT SMOKY MOUNTAINS NATIONAL PARK (July 15, 2013) – A popular trail on the Tennessee side of Great Smoky Mountains National Park is open for weekend hikers after replacement of a 70-foot-long bridge over a mountain stream. Chimney Tops Trail itself is undergoing a full rehabilitation from a Trails Forever crew every Monday through Thursday and is open to hikers Friday through Sunday. Oct. 17 is the target for work completion. The trail was closed in January after high waters destroyed the bridge over Walker Camp Prong at the beginning of the trail. 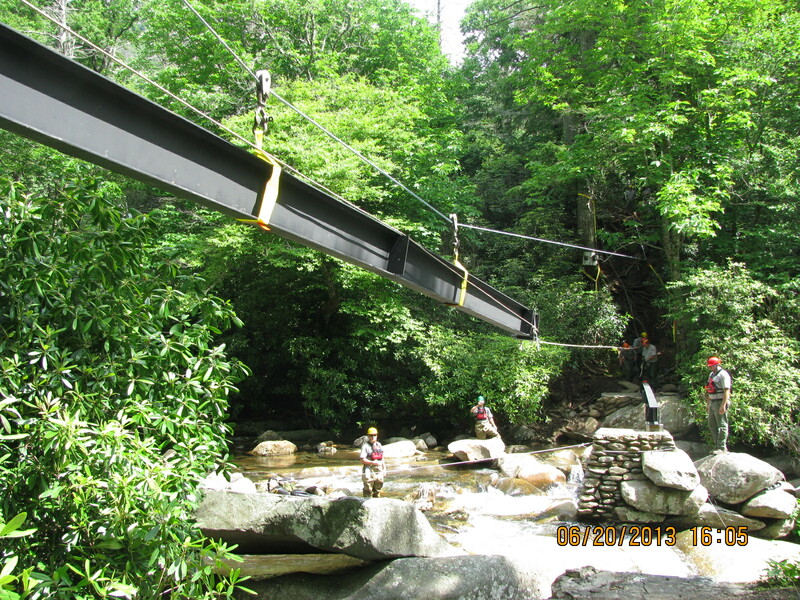 Working in an environmentally sensitive area, the bridge crew primarily used hand-operated tools and pulleys to position the bridge’s steel I-beams. Information about all aspects of the park is at nps.gov/grsm. Human ingenuity and labor, not heavy equipment, were key to new bridge on Chimney Tops Trail.